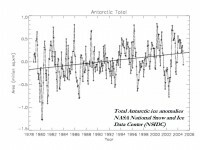 A New Record for Antarctic Total Ice Extent? While the news focus has been on the lowest ice extent since satellite monitoring began in 1979 for the Arctic, the Southern Hemisphere (Antarctica) has quietly set a new record for most ice extent since 1979. This can be seen on this graphic from this University of Illinois site The Cryosphere Today, which updated snow and ice extent for both hemispheres daily. The Southern Hemispheric areal coverage is the highest in the satellite record, just beating out 1995, 2001, 2005 and 2006. Since 1979, the trend has been up for the total Antarctic ice extent. While the Antarctic Peninsula area has warmed in recent years and ice near it diminished during the Southern Hemisphere summer, the interior of Antarctica has been colder and ice elsewhere has been more extensive and longer lasting, which explains the increase in total extent. This dichotomy was shown in this World Climate Report blog posted recently with a similar tale told in this paper by Ohio State Researcher David Bromwich, who agreed “It’s hard to see a global warming signal from the mainland of Antarctica right now”. 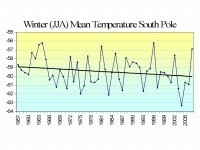 Indeed, according the NASA GISS data, the South Pole winter (June/July/August) has cooled about 1 degree F since 1957 and the coldest year was 2004. This winter has been an especially harsh one in the Southern Hemisphere with cold and snow records set in Australia, South America and Africa. We will have recap on this hard winter shortly. See full story here.